After all of our Sunday errand running yesterday, it was time to give the Mooser a little TLC. 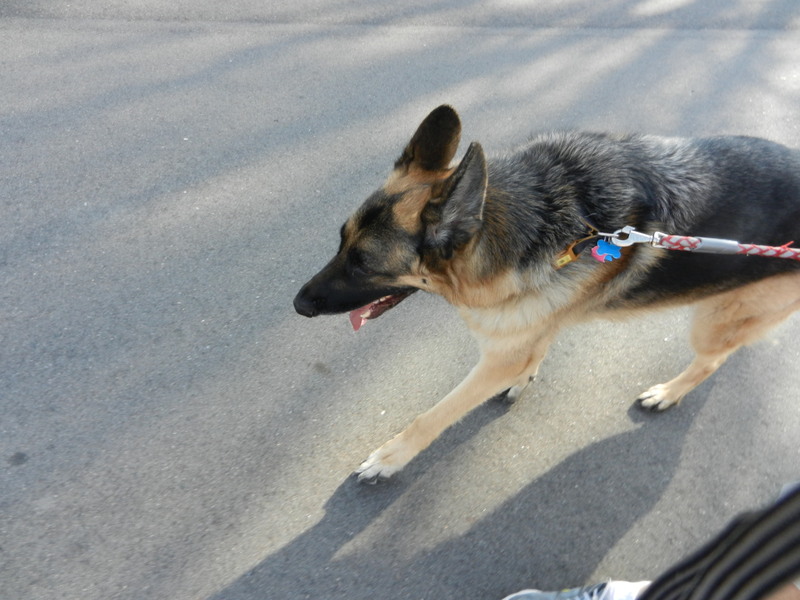 We took him out for a nice hilly walk where he sniffed and explored as if he had never seen the outside world before. 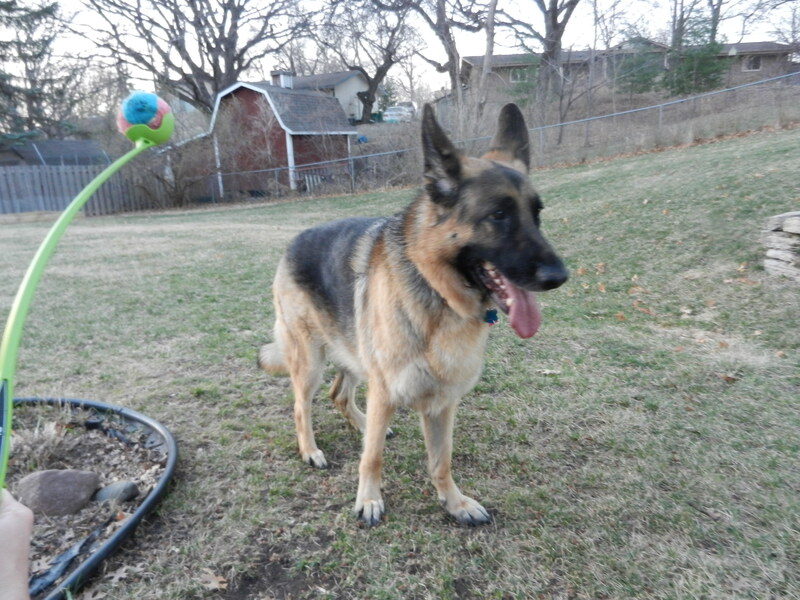 That’s 92 plus pounds of lean mean doggy machine. 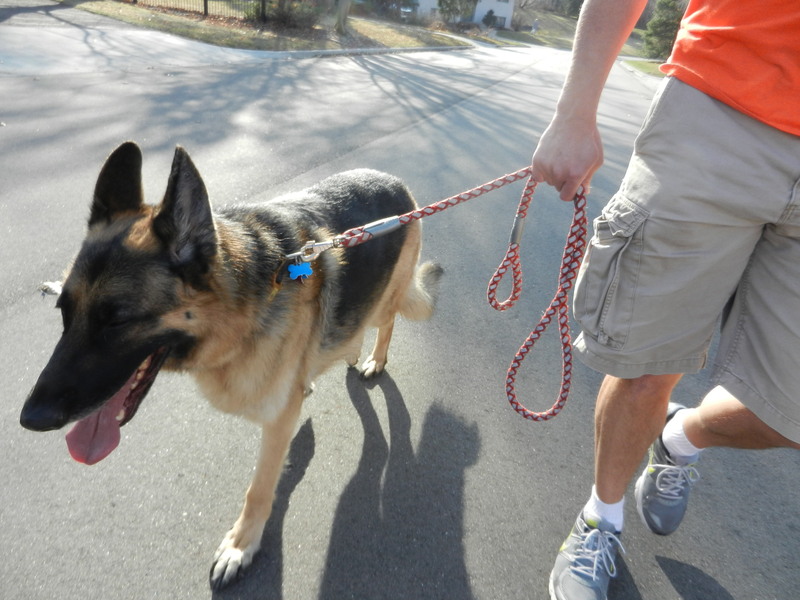 I worked up an appetite out on our walk and had plans for a killer stir fry for dinner. Before our walk I began marinading Tempeh in soy sauce and garlic powder (I used the other half of the Tempeh a few weeks ago in spaghetti sauce and froze the other half which I used last night). When we got home I first got the quinoa cooking in the rice cooker: one cup of quinoa to two cups of water. I love how the rice cooker cooks the quinoa. I made a cup because I wanted leftovers. Next, I began chopping up the veggies. I had leftover asparagus from two days ago that I hadn’t made into asparagus wraps so I chopped that up along with green cabbage, carrots, mushrooms, and red onion. I poured about a half a tablespoon of garlic olive oil in the wok, heated it up, then added onions. I let the onions cook down for a minute before adding the mushrooms. 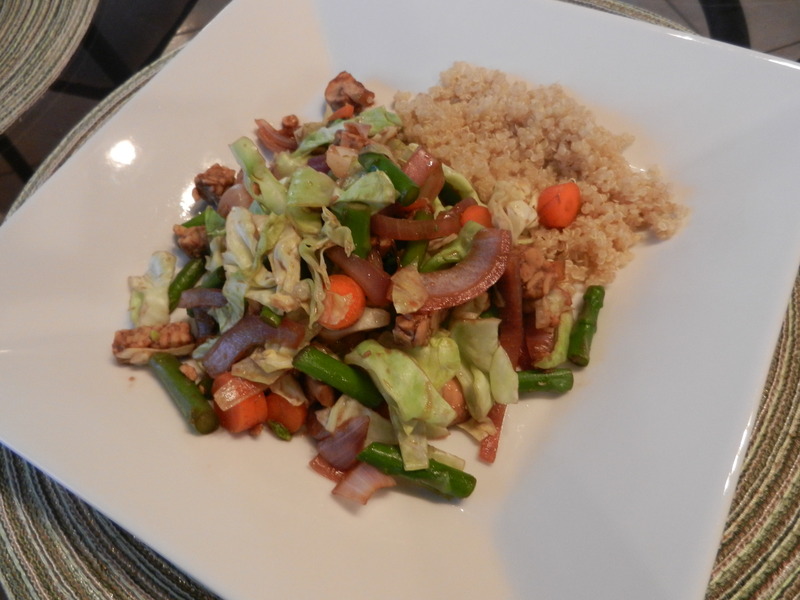 Next, I added the asparagus and carrots, and then lastly the tempeh and cabbage. I flavored the stir-fry with soy sauce, rice vinegar, garlic powder, and a little ginger. 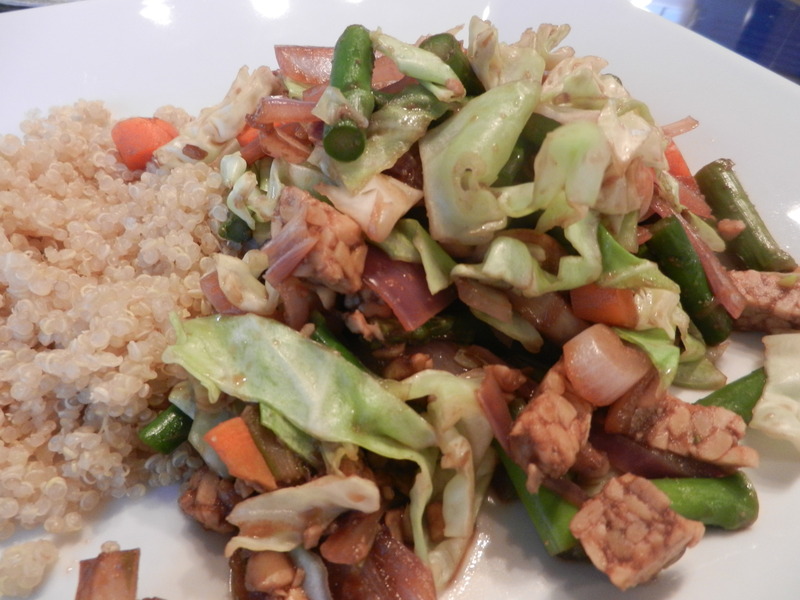 Once the quinoa was done cooking and the cabbage in the stir-fry had started to wilt ever-so-slightly, I plated everything up, gave it one last splash of soy sauce (because I love sauciness) and chowed down. This was my first time putting cabbage into stir-fry and I’d say it was a winner! After dinner we watched a couple of episodes of Modern Family, Season 1, then headed out to the backyard to entertain the dog for a little while. 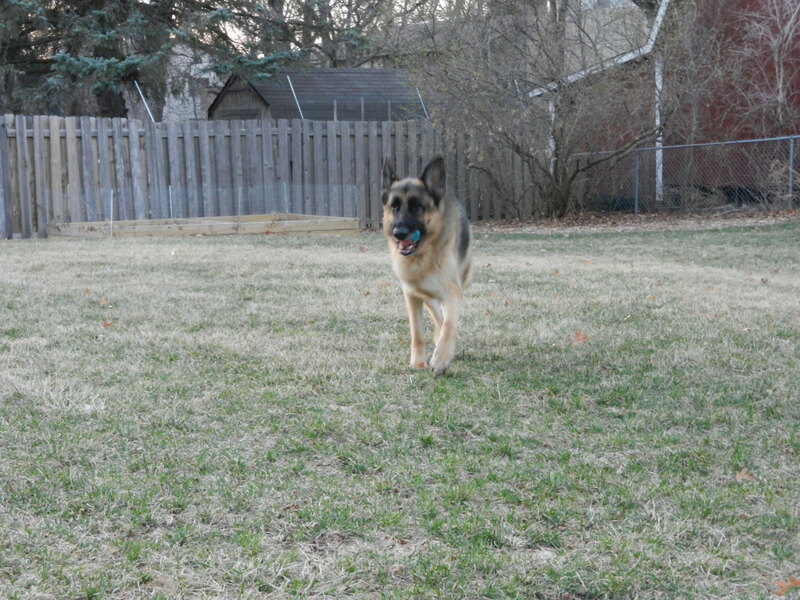 Dana threw the ball to Moose using the Chuckit! 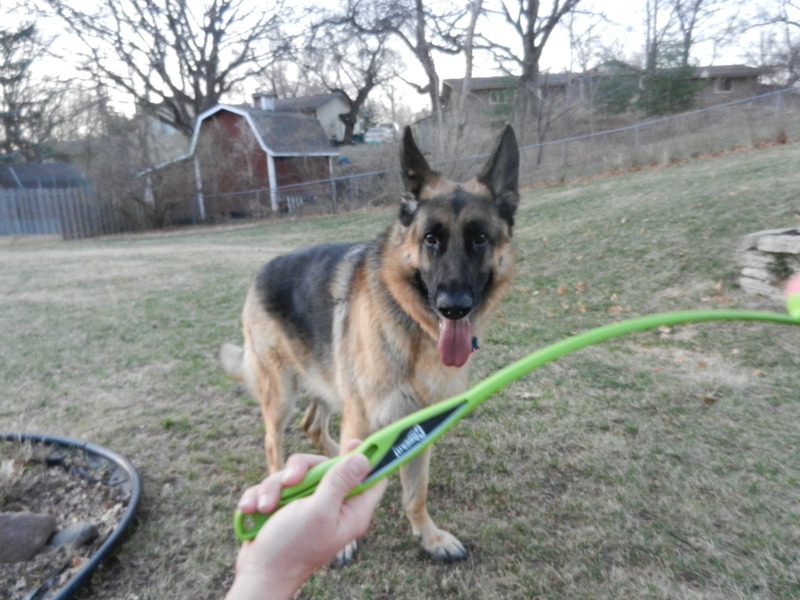 which is one of the best dog toy inventions in my opinion. You don’t have to touch the nasty slimy tennis balls ever. You grab it with the claw of the Chuckit! and “chuck” the ball, and it does all the dirty work for you. How about that. 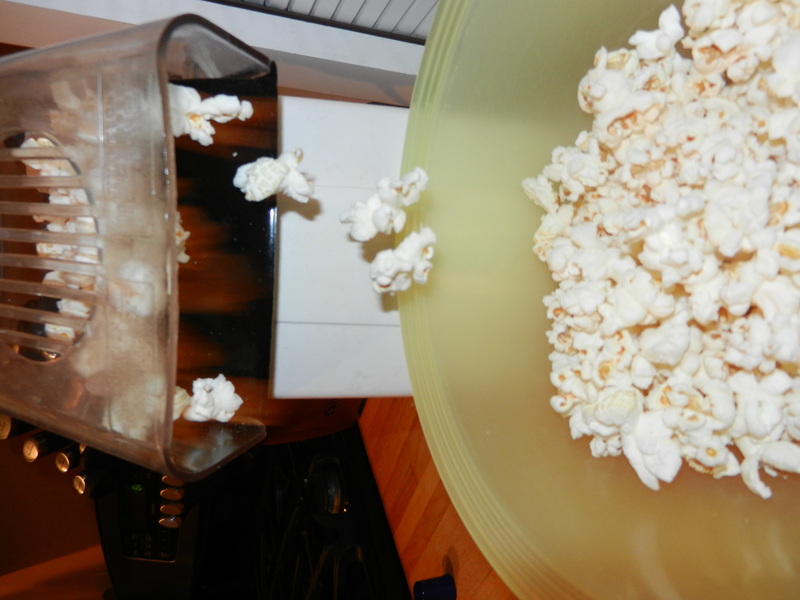 I made myself an evening snack of PoPcOrN! I spruced it up with some butter spray and salt and it was the perfect salty snack to conclude my Sunday with. Now, I am going to get this body moving. Hope everyone is having a tolerable Monday! Oh, I almost forgot. I decided last Monday that every Monday I wanted to write something positive considering I am trying to rekindle my battered relationship with Mondays. So, today I am very happy because I have the day off and my family is coming over for dinner tonight. There. Let’s hear your positive Monday talk! 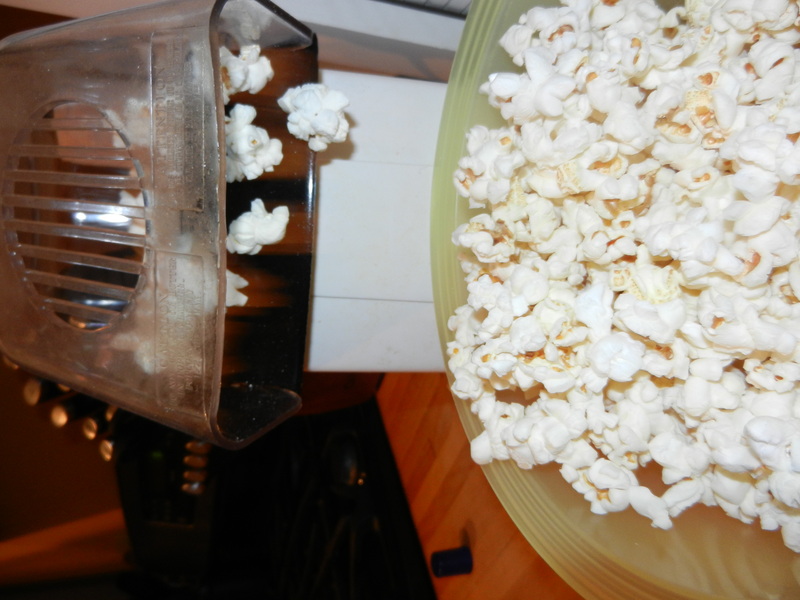 This entry was posted in Dinners, Home Life, Moose, Recipes and tagged Food Trials, Moose, Snacks, Veggies by Melanie. Bookmark the permalink.